This chapter gives an overview of modern latent variable models for well-being (WB) research. After a short introduction into the importance of measurement error and methodological artifacts that can be produced by measurement error, the basic principles of four types of latent variable models are described: item response theory, latent class analysis, factor analysis, and latent profile analysis. Then, latent variable models for multidimensional data structures are discussed and it is shown how the models can be used to define general WB measures and facet-specific factors. It is pointed out how these models can be applied in multimethod WB research and how the convergent and discriminant validity can be measured in this context. Finally, a very general model for analyzing variability and change in WB is presented and it is discussed how this model and special cases of this model can be applied in WB research. Over the last decades, there has been an enormous progress in the development of advanced statistical methods in the social and behavioral sciences. This chapter will give an overview of some important methods that are relevant for well-being (WB) research. It will focus on measurement models that are appropriate for representing the specific characteristics of WB measures. These measurement models can be used in more complex models to analyze the causes and consequences of WB. As the chapters of this handbook show there are many measures of WB that have been developed over time. If a researcher uses, for example, two different measures in a study, she or he will realize that these two measures will not perfectly coincide. It would not be possible to perfectly predict interindividual differences in WB on one measure using another. Even if one measures the same individuals repeatedly using the same WB measure it is likely that the results are not perfectly the same. To interpret the empirical results of WB research appropriately, it is necessary to understand the reasons for the divergence of WB measures, to estimate the degree of divergence, and to consider the sources for these degrees of divergence. This can serve to avoid methodological artifacts that could lead to invalid conclusions. Why is it important to consider measurement error? How can measurement error be considered? How can the multidimensional structure of WB measures be modelled? How can method effects be measured? How can change in WB be measured? The approaches presented assume that a random sample is drawn from a population of interest. In some research contexts, sampling is more complex. One example is cross-cultural WB research in which random samples are taken from different nations. Another example is organizational WB research, in which a multilevel sampling process is usual. In a two-level sampling process, for example, first organizations (e.g., companies, schools, villages; level-2 units) are drawn from a population of organizations and then for each organization a random sample of individuals (level-1 units) is selected. At the end of this chapter it is discussed how the approaches presented can be extended to these more complex research designs. Measurement error cannot be avoided in any empirical science. Because of measurement error one would get different scores for the same individual even if one theoretically could measure the same individual with the same instrument repeatedly at the same time. In measurement error theory (classical psychometric test theory, Lord & Novick, 1968) one decomposes the observed score of an individual into a true score and a measurement error score. The true score is the score of an individual one would get if one could measure the individual repeatedly and calculate the mean score across all replications. Because it is not possible to repeatedly measure the same individual at the same time, measurement models have been developed to separate measurement error from true scores that are built on more viable research designs. The separation of measurement error from true scores in these measurement models is important for different reasons. First, it allows estimating the reliability of the measurements and judging whether measurement error is low enough so that the measures can be trusted. Second, measurement error can cause many methodological artifacts. Consider, for example, that a researcher has conducted an intervention study to increase WB. She is interested in whether there is a correlation between the WB scores before the intervention started (pre-scores) and the change of the WB scores (WB after the intervention minus WB scores before the intervention). She finds a negative correlation between the change scores and the pre-scores and is very happy about this result, because this indicates that individuals with a low pre-test WB score have profited more than individuals with a high pre-test score. However, this could be a pure methodological artifact as it can be shown that measurement error decreases the true correlation between the change scores and the scores before the intervention (Rogosa, 1995). Even if the true change scores and the true pre-scores are unrelated, measurement error will produce a negative correlation and can lead to wrong conclusions. Also in quasi-experimental research, measurement error can produce serious artifacts. Consider the evaluation of a WB intervention in which random assignment was not possible but participants assigned themselves to the intervention vs. control groups. People being high in WB might have chosen the intervention group more often because they are more active and more interested in WB issues. In this case of self-selection, a researcher has to correct for group differences in the pretests in order to evaluate the intervention appropriately. Assume that there is a positive (but not perfect) correlation between the observed pre-test and the post-test scores and that each member of the control and the intervention shows exactly the same increase of true WB scores (no treatment effect). If this study is analyzed by a regression analysis with the independent variables pre-test and group there could be a significant effect of the group factor indicating a treatment effect that would be an artifact caused by measurement error (Lord, 1967). It is important to note that this effect does not show up if a repeated measures analysis of variance is applied. This difference between the two analysis methods is called Lord’s paradox (Lord, 1967). Lord’s paradox shows that even the regression coefficient of an independent variable in a regression analysis that is measured without error (group membership: intervention vs. control group) can be distorted if the measurement error of another independent variable (WB pre-test scores) is not appropriately corrected for. These two examples demonstrate why it is important to correct for measurement error in WB research. In order to consider measurement error psychometric models are necessary. In general, four types of psychometric models can be distinguished (Bartholomew & Knott, 1999, see Table 1). This distinction is based on the type of observed variables (categorical vs. metrical) and the types of latent (error-free) variables (categorical vs. metrical). Models with metrical latent variables are dimensional models whereas models with categorical latent variables are typological models. In dimensional models, it is assumed that individuals as well as items can be ordered on one (or more) continuous variables, whereas this ordering is not necessary for typological models. The basic ideas of these types of models are explained with respect to one simple representative of each type. 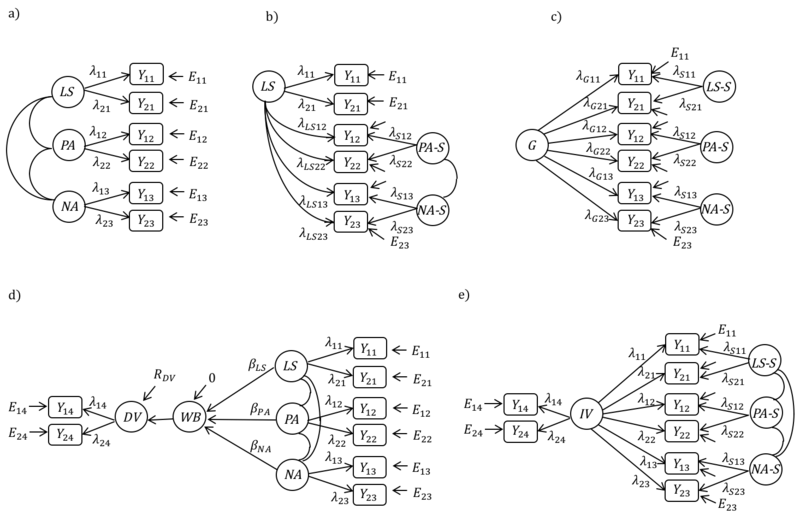 In Figure 1a the one-parameter logistic test model (also called the Rasch model; Rasch, 1960) is shown. This model is a model for dichotomous observed variables (items) measuring a continuous latent variable. Consider the (hypothetical) example that participants rated their momentary WB using the three items well, cheerful and happy and a two-category response format (no, yes). In the Rasch model, it is assumed that the probability to choose the category yes depends on a value of an individual on a continuous WB dimension (see Figure 1a). The higher the value of an individual on the WB dimension (latent variable) the higher is the probability to choose the category yes. However, the probability will never be perfectly 1 (or 0) because of measurement error. Because the probability of the response no is 1 minus the probability of the response yes, it is sufficient to consider only one response probability. Individuals differing in their WB will differ in their values on the latent WB variable and can be ordered on the latent dimensions. These values are not known but can be estimated given their responses to all items. Also, the items can be ordered on the latent dimension according to their difficulty. The item happy in Figure 1a is more difficult than the item well because an individual needs to have a higher value on the latent WB dimension to obtain a high probability for the category yes than it is the case for the item well. The item cheerful is located on the latent WB between the two other items. An item difficulty parameter is defined as the value of the latent WB dimension that is linked to a response probability of 0.50. These difficulty parameters are not known but they can be estimated given the response patterns of the participants. The Rasch model assumes that the curves describing the response probabilities as functions of the latent WB dimension (so-called item characteristic curves) do not differ in their forms between items. Moreover, the model assumes that the latent dimension explains the observed associations (correlations) between the items perfectly (assumption of local independence): The items are correlated because they are measuring the same construct (latent variable). Their correlations, however, are not perfect because of measurement error. The assumption that the items are fulfilling the assumptions of a Rasch model can be statistically tested and there are several ways to relax the assumptions of this model. For example, it can be allowed that the item characteristic curves differ in their steepness by integrating a discrimination parameter in the model (so-called two-parameter logistic model or Birnbaum model; Birnbaum, 1968). Dimensional models for categorical response variables have been extended to more than two response categories. There are special models for items with ordered response categories (for an overview, see Nering & Ostini, 2010; Ostini & Nering, 2006). In the partial credit model, for example, there is a probability function for each category of an item (category characteristic curve) that describes the probability to give a response in this category as a function of the latent dimension (Masters, 1982). As the latent dimension is also called latent trait, this family of models is called latent trait models. Because the item responses are modelled in these models, they are also called models of item response theory. Latent trait model also exist for items with unordered response categories (e.g., nominal scale model; Bock, 1972). An important property of the model in Figure 1a is that all items and individuals can be ordered on the same continuum. This implies, for example, that the item happy is more difficult than the item well for all individuals and items. The assumption that all items and all individuals can be ordered on a common latent dimension might not be appropriate for all individuals. Consider, for example, the assessment of domain life satisfaction with the three items marriage, leisure activities, and job and a dichotomous response format (satisfied, dissatisfied). Applying the Rasch model, for example, to these three items would require that the three domains are ordered for all individuals in the same way. For example, the ordering marriage, leisure activities, and job would imply that all individuals would have a higher probability to be satisfied with their marriage than with their job or leisure activities. However, there might be individuals being happier with their job than their marriage and their leisure activities, and other configurations are possible. In areas of research where it is theoretically and/or empirically not possible to order items on a dimension in a way that is obligatory for individuals, a typological model with a categorical latent variable is more appropriate. Latent class analysis (LCA) is a typological model for observed categorical variables (Lazarsfeld & Henry, 1968). In Figure 1b, a (hypothetical) latent class model for the three satisfaction items and two latent classes is presented. LCA assumes that the whole population consists of subpopulations (latent classes) that differ in the response probabilities for the categories of the observed items. Each individual of the population has to belong to one, but only one latent class. The number of latent classes is not known but can be estimated given the observed response patterns of individuals. The membership of an individual is also not known but the probability of belonging to the different classes can be estimated for each individual (assignment probabilities) and individuals can be assigned to the latent class for which the assignment probability is maximum. All members of the same latent class show the same response probabilities for the item categories. The members of different latent classes differ in the profiles of their response probabilities. The latent class structure explains the associations (correlations) between the observed items perfectly. That means that within each latent class the items are independent and observed response differences between individuals belonging to the same class are due to measurement error. In the model in Figure 1b, the first class is characterized by high probabilities for being satisfied with marriage and leisure activities and for being dissatisfied with the job. Class 2, on the other hand, is described by high probabilities for being satisfied with the job and dissatisfied with marriage and leisure activities. Whether a latent class model fits the data and how many latent classes are necessary can be statistically tested. LCA can be easily extended to items with more than two categories. In the case of multiple categories, the class-specific response probabilities are estimated for all categories of an item. LCA can also be applied to items with ordered response categories (e.g., Rost, 1985). An overview of LCA and their applications is given by Hagenaars and McCutcheon (2002). Similarities and differences between latent class and latent trait models are discussed by Heinen (1996). Figures 1a and 1b show important differences between dimensional and typological models. These models have different areas of applications and a researcher has to decide which type of model is more appropriate for analyzing the research question and data structure considered. Models for metrical observed variables are based on the same principal ideas as the models for categorical observed models. In dimensional models for metrical response variables the item characteristic curves are not curvilinear such as in latent trait models (see Figure 1a), but linear. In Figure 1c the item characteristic curves for three items and one latent dimension is presented. In this model, the (conditional) expected value of an items is considered as a function of the latent dimension (factor). The deviations of the observed values from the item characteristic curves are due to measurement error. The observed values (not shown) scatter around the line (item characteristic curve). The models are called factor analytic models or factor models (e.g., Bartholomew & Knott, 1999). These models are applied to metrical variables such as scale scores or response times. The model in Figure 1c is a one-factor model. The straight lines (upper part of Figure 1c) differ in their slopes (factor loadings). In this model, an observed variable is decomposed in one part that is predicted by the latent dimension (factor) and measurement error. The measurement error variables are assumed to be uncorrelated. This implies that the factor explains the correlations of the observed variables perfectly. As in latent trait models, the observed variables (e.g., scales) are correlated because they measure the same construct but they are not perfectly correlated because of measurement error. Factor analytic models are often depicted as path models (lower part of Figure 1c) in which the latent variable (factor) is shown as a circle or oval having an influence on the observed variables (squares). The error variables are denoted by the letters E.
Typological models for metrical observed variables are called latent profile models (Lazarsfeld & Henry, 1968). Like in LCA it is assumed that the population consists of different subpopulations. The subpopulations, however, differ in the profiles of the mean values of the metrical observed variables. If the three domain satisfaction items were measured on a continuous scale, the result of a latent profile analysis can look like the result in Figure 1d. The first class is characterized by high expected mean values on the items marriage and leisure activities and a low expected mean on the item job, whereas it is the other way around in Class 2. In classical latent profile analysis, it is assumed that the observed variables are normally distributed in all latent classes and that the observed variables are independent within latent classes. The four models presented in Figure 1 are prototypical models. Over the last years, the development of psychometric models have made enormous progress and it is possible to extend and to combine these models in different ways. LCA has been combined with other statistical models to detect subpopulations that differ in the parameters of a statistical model (so-called mixture distribution models, e. g., Hancock & Samuelsen, 2008). For example, LCA can be combined with latent trait or with factor models to scrutinize whether there are subpopulations differing in item difficulty parameters or factor loadings. Factor analytic models have also been extended in such a way that different types of observed variables (e.g., metrical, ordinal) can be simultaneously analyzed (e. g., Jöreskog & Moustaki, 2001). There are many computer programs available for analyzing latent variable models. There are also several packages of the computer program R that can be downloaded at no charge from the internet. The R internet page Psychometric Models and Methods (https://cran.r-project.org/web/views/Psychometrics.html) gives an overview of currently available R packages for latent variable modeling. Well-being is a construct consisting of different components. For example, subjective well-being (SWB) typically comprises the three constructs life satisfaction (LS), positive affect (PA), and negative affect (NA). How distinct are these three constructs? Is it necessary to consider them all in an empirical study? How can their relationships be explained? How can the information that is represented by the three traits be combined to predict dependent variables such as health and longevity? To scrutinize these important research questions the models presented in Figure 1 have to be extended to multidimensional models. The basic structure of these models will be explained only for metrical observed and latent variables [models of confirmatory factor analyses (CFA)] but the basic idea of these models can be transferred to other variable types (for multidimensional IRT models see, for example, Deboeck & Wilson, 2004; Reckase, 2009; for models of CFA for ordinal variables see, for example, Jöreskog & Moustaki, 2001; for multidimensional LCA, see, for example, Hagenaars, 1993). Figure 2. a) Model with correlated factors; b) Bifactor (S-1) model; c) Bi-factor model; d) Model with common independent factor; e) Model with formative well-being factor. Models of confirmatory factor analysis for multidimensional data structures. Yik: observed variables, i: indicator, k: facet. λ: loading parameters. Eik: residual (measurement error) variables. LS: life satisfaction, PA: positive affect, NA: negative affect, WB: well-being, DV: dependent variable, IV: independent variable, -S: specific factor. In Figure 2a, a multidimensional model with three latent variables (factors) for the three facets of SWB is depicted. For simplicity, only two observed variables (indicators) for each latent variable (factor) are presented. This model allows for analyzing the latent correlation between the three factors. These correlations are higher than the correlations between the observed variables because they are not distorted by measurement error. This model allows (a) to test whether the non-perfect correlation between the observed variables is only due to measurement error or whether the three facets are distinct, (b) to estimate the degree of discriminant validity [indicated by a (low) correlation coefficient], and (c) whether the different indicators are distinct indicators of the different latent variables (indicated by no cross-loadings). The parameters of the model can be estimated and the goodness-of-fit of this model – as all other models in Figure 2 – can be evaluated by statistical tests and fit indices that have been developed for structural equation models (SEM; for an overview see Hoyle, 2012; Mulaik, 2009; Schumacker & Lomax, 2010). Several computer programs have been developed for analyzing SEM. One of them is the publicly available R-package lavaan (Beaujean, 2014; Rosseel, 2012) that can be downloaded at no charge from the internet. If the different components are distinct, researchers are often interested in the specific part of a component that is not shared with the other components. Moreover, the causes of these differences can be analyzed, and it can be investigated whether the components have a unique contribution to predicting and explaining other dependent variables. There are several ways to define a specific part of a component. One way is to select one component as a reference component and to define the specific part of another component as that part that cannot be predicted by the reference component. This approach is depicted in Figure 2b. In the model in Figure 2b, the latent LS variable is taken as reference factor that predicts all other observed variables. That latent part of PA that cannot be predicted by LS is represented by the specific factor PA-S that is uncorrelated with the LS factor. The PA-S factor is a residual factor like a residual in traditional regression analysis and can be interpreted accordingly. It always has a mean of 0. A positive value of an individual on the PA-S factor indicates that this individual shows a higher PA than one would expect given the LS of this individual. A negative value indicates that the person’s PA is lower than is expected for a person with this latent LS score. An analog interpretation is true for the specific factor NA-S. The correlation between PA-S and NA-S is a partial correlation. It indicates that part of the association between PA-S and NA-S that is not due to LS. The variance explained by the LS factor and the specific factors can be compared. The proportion of variance of an observed variable by a factor (that is uncorrelated with another one) equals the squared factor loading. The sum of the two squared factor loadings equals the reliability of an observed variable in the model in Figure 1b. The larger the explained variance by a specific factor compared to the explained variance by the LS factor the larger is the component specificity. The partial correlation is 0 if LS explains the total correlation between PA-S and NA-S. The model depicted in Figure 2b is called bifactor-(S-1) model and is described in detail by Eid, Geiser, Koch and Heene (2016). If a specific factor had been defined for the indicators of the LS factor in Figure 2b, and if it had been additionally assumed that all specific factors are uncorrelated, the model is called bi-factor model (see Figure 2c; Holzinger & Swineford, 1937). The factor on the left-hand side would then not be the LS factor but a general factor (G factor). In the case of components of a construct that are not interchangeable, the application of the bi-factor model usually produces problematic results and the meaning of the G factor is not well defined (see Eid et al., 2016, for a deeper discussion). The components of a construct, however, are usually not interchangeable (LS is theoretically a different construct than PA and NA), and, therefore, the bi-factor might not be appropriate for these types of applications. The LS factor and the specific factors in Figure 2b can be correlated with other variables in an extended model (not shown here). They can also be modelled as independent and dependent variables in a latent regression analysis. If specific factors are taken as dependent variables in a regression analysis some arrangements (e.g., transformations) have to be made to avoid methodological artifacts (see Koch, Holtmann, Bohn, & Eid, in press, for a detailed discussion and some guidelines). A second way to define specific factors is to regress all observed variables of SWB on another independent variable (IV) as it is done in Figure 2d. Then, residual factors for all facets of SWB can be defined indicating that part of a SWB facet that is not predicted by the IV. The values of the specific factors and their correlations have a similar meaning as in the model presented in Figure 2b. Assume, for example, that the IV in Figure 2c is flourishing. A positive value of LS-S would then indicate that the LS of this person is higher than one expects for a person having such a flourishing score. Also in this model the variance explained by the IV (flourishing) and by the specific factors can be compared to get a measure of the degree of facets specificity. If the facet specificities in Figure 2d were large, this would indicate that flourishing and SWB are quite different constructs. In some studies, researchers are interested in combing the different facets to a general SWB score to predict a dependent variable (DV) such as health or income. In Figure 2e such a model is presented. In this model, the general WB factor is a linear combination of the three facets. This makes it necessary to fix the variance of the residual of the WB factor in the latent regression to 0. Such a measurement model is called a formative measurement model (e.g., Willoughby, Holochwost, Blanton, & Blair, 2014). An alternative is a reflective measurement model of a general WB factor such as the bi-factor model (Figure 2c). To define a general WB factor in a formative measurement model it is necessary that there is a dependent variable in the model that is regressed on the WB factor. Defining a general WB factor in such a formative measurement model has several advantages compared to a general factor in the bi-factor model. First, the bi-factor model causes many application problems in typical application areas of psychology because it is misspecified for the construct that are typically considered in multidimensional models (Eid et al., 2016). Second, the WB factor in Figure 2e is always the best combination of the three facets LS, PA and NA for the DV considered. That means that the meaning of the WB factor changes with changing DV. PA might, for example, having a stronger impact on WB than NA when predicting creativity, whereas NA might have a stronger influence on WB than PA when predicting reasoning tasks. Although formative factors are rare compared to reflective factors in psychology, they are promising for future WB research. The most widely used assessment method in research on WB is self-report. WB refers to the inner state of an individual and the individual is the person that might best know her or his WB. However, are self-reports valid? Are there other assessment methods that provide important information about the WB of an individual that goes beyond self-report? There are many studies on the validity of self-reports that are summarized in Chapter 5 of this volume and their results will not be reiterated here. One important strategy in validity research is to apply different methods and to analyze their convergent validity (Campbell & Fiske, 1959). These multimethod studies typically show that there are strong method effects. Methods effects, however, are not the “serpent in the psychologist’s Eden” (Cronbach, 1995, p. 145) but they represent important substantive effects. Validity research typically focus on estimating the convergent validity but not on understanding method effects. For example, peer ratings of WB are used to analyze their correlation with self-reports but there is less research on the question why peer reports of WB differ from self-reports. In order to get a deeper understanding of the results of WB research, method effects have to be understood. How can method effects be analyzed? In recent research on method effects two types of latent variable models are distinguished that define method effects in a different way (Eid, Geiser, & Koch, 2016). These models are the models presented in Figure 2b and Figure 2c for multidimensional data structures. These models can be applied to multimethod research by replacing the different facets by different methods. The first model (Figure 2b) is appropriate for structurally different methods, whereas the second model (Figure 2c) is appropriate for interchangeable methods (Eid, Geiser, & Koch, 2016). The difference between these two types of methods can be explained with respect to multiple rater studies. Multiple raters can be considered as multiple methods (Kenny, 1995). Interchangeable raters stem from the same population of raters, for example, different peers rating a common friend, or different students rating the same teacher. Structurally different methods do not stem from the same population. For example, if the WB of a child is measured by a self-report, a parent report and a teacher report, the self, parent, and teacher do not stem from the same population of interchangeable raters, they have different social roles and experience the child in quite different contexts. Other examples of structural different methods are observational methods, physiological measures, reaction time measures, etc. (see Eid et al., 2008; Koch, Eid, & Lochner, in press, for a deeper discussion of these differences and their implications for modeling multimethod data). In the multimethod model in Figure 2b a reference method (e.g., the child self-report) is selected and contrasted with the other methods (e.g., parent report, teacher report). The method factors have a similar meaning as the facet-specific factors. A method factor represents the over- vs. underestimation of trait with respect to the value expected based on the reference method (e.g., self-report). The correlation between two method factors shows whether two methods have something in common (e.g., common view of different raters) that is not shared with the reference method. In the multimethod model in Figure 2c there is a common factor underlying all interchangeable methods. If the three methods considered are, for example, three peer ratings (three friends of a target) and the peers are randomly assigned to three groups, the general factor measures the expected trait value of a target across all interchangeable raters. The method factor represents the deviation of the single raters from the expected values across all raters, that means, it represents the rater-specific view. Because the raters are interchangeable and nested within targets the three method factors are uncorrelated (Nussbeck, Eid, Geiser, Courvoisier, & Lischetzke, 2009). In the two models presented in Figure 2b und 2c, the variance explained by the factor on the left hand side (squared standardized loadings of the general factor having an influence on all observed variables) is a measure of convergent validity, whereas the variance explained by the method factors (squared standardized method factor loadings) is a measure of method specificity. The general factor and the method factors of the models can be related to other variables to explain individual trait differences and method effects. The models presented in Figure 2d and 2e can also be applied in multimethod studies in order to explain the convergence of different methods (Figure 2d) and to combine different methods (e.g., different raters and/or different physiological variables) for predicting a dependent variable (e.g., health) in an optimal way (Figure 2e). The multimethod models in Figure 2b and 2c can be extended to multitrait-multimethod (MTMM) models to estimate not only the convergent but also the discriminant validity (see Eid et al., 2008; Koch et al., in press). A guide to more complex multimethod models is given by Eid, Geiser and Koch (2016). MTMM models for ordinal variables are presented by Nussbeck, Eid and Lischetzke (2006), LCA MTMM models are discussed by Nussbeck and Eid (2015) as well as Oberski, Hagenaars and Saris (2015). In the analysis of change two general change concepts are considered – variability and change in the narrow sense (Nesselroade, 1991). Whereas variability refers to reversible short-term fluctuations, change in the narrow sense characterizes change processes that are more long lasting and less reversible (Nesselroade, 1991). The variability of WB measures is often analyzed in a state-trait model of WB. Momentary WB states are considered as fluctuations around a stable WB trait (habitual WB level, set-point, well-being trait, e.g., Eid & Diener, 2004). Several studies have shown that intraindividual variability itself can be considered a personality trait as individuals differ in stable way in the variability of their well-being states (e.g., Eid & Diener, 1999). Examples of change in the narrow senses are developmental processes and trait changes caused, for example, by interventions. The variability of WB states is often analyzed in longitudinal studies comprising many repeated measurements in a relatively short period. Change processes in the narrow sense are often analyzed with larger time lags between repeated measurements and long time periods. However, variability and change (in the narrow sense) are not totally distinct processes, and it might be the more typical case that they overlap. Even the measurement of stable personality traits take place in specific situations that might cause a certain degree of variability (Deinzer et al., 1995; Eid & Diener, 2004). How can both types of change be measured and separated from change due to unsystematic measurement error? Over the last years, the development of latent variable models for analyzing change has been a major topic of psychometric research and not all models can be presented (for an overview see, for example, Collins & Sayer, 2001; Eid & Kutscher, 2014; Laursen, Little, & Card, 2012; Little, 2013; McArdle & Nesselroade, 2014; Mehl & Conner, 2012; Molenaar, Lerner, & Newell, 2014; Newsom, 2015; Singer & Willet, 2003). Instead of presenting different models for specific purposes, the basic principles of latent change modeling will be presented with respect to a very general longitudinal model for analyzing variability and change (see Figure 3a) that contains various longitudinal models as special cases (Eid, Courvoisier, & Lischetzke, 2012). This model is a combination of latent growth curve models (Bollen & Curran, 2004; 2006; Curran & Bollen, 2001; Duncan, Duncan, & Strycker, 2006) with latent state-trait models (Cole, Martin, & Steiger, 2005; Eid & Hoffmann, 1998; Steyer, Mayer, Geiser, & Cole, 2015). Figure 3. a) Path model; b) Model for two individuals A and B and one period of time. The colors correspond to the colors and variables in figure a). General longitudinal model. Yikp: observed variables, i: indicator, k: occasion of measurement, p: period. λikp, λIikp: loading parameters. Eikp: residual (measurement error variables). Ip: intercept factor, Lp: slope factor, Skp: latent state variable; Rkp: occasions-specific residual, Ukp: occasion-specifc residual indicating unpredictability. βk(k-1)p: autoregressive parameter. For reasons of clarity not all parameter labels are included. The model presented is a model for two time periods, for example, the periods before and after an intervention or for two days of an experience sampling study. The model can easily be extended to more than two time periods. Within each time period, there are multiple repeated measurements. For each occasion of measurement there are two indicators of a latent state variable Skp characterizing the true WB state on an occasion of measurement k in a period p. On the level of the latent state variables a latent growth curve structure with a linear trend is specified. According to the linear growth model, the state change of each individual can be characterized by a linear trend. The basic idea of this model for two individuals is depicted in Figure 3b. The intercept and the slope of the linear trend can differ between individuals. 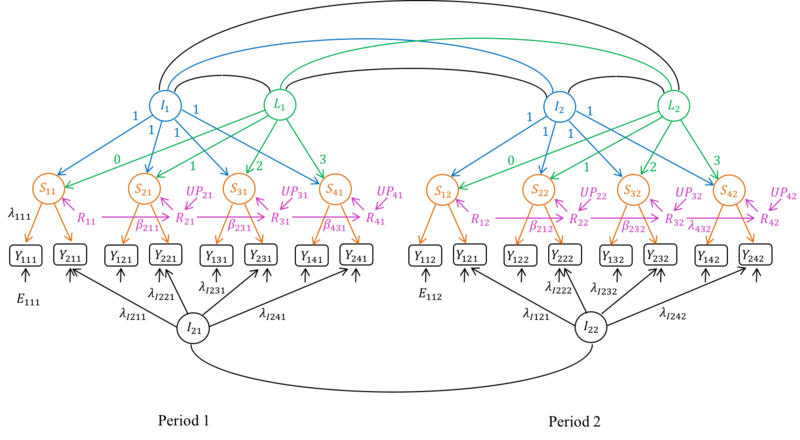 The individual intercept is a value of the latent intercept factor Ip. The larger the variance of this factor, the larger are individual differences in the intercepts. The mean value of the intercept factor represents the mean slope of the change process. The individual slopes are values of the slope factor Lp. A large variance indicates large differences in the linear trends. The mean value of this factor is the mean slope across all individual slopes. If the variance and the mean of the slope factor are 0, there is no linear trend in the data and the growth factor can be removed. In this case, the model reduces to a so-called latent state-trait model with autoregressive effects (Cole et al., 2005; Eid, Holtmann, Santangelo, & Ebner-Priemer, 2017). The intercept factor is then the trait factor characterizing the individual WB level over time. The linear curves do not perfectly determine the change of the state variables because there are residual variables Rkp. These residuals indicate momentary deviations from the linear trend (or in the case without a linear trend from the latent trait) are due to occasion-specific influences. In addition, there are autoregressive effects on the level of residuals. 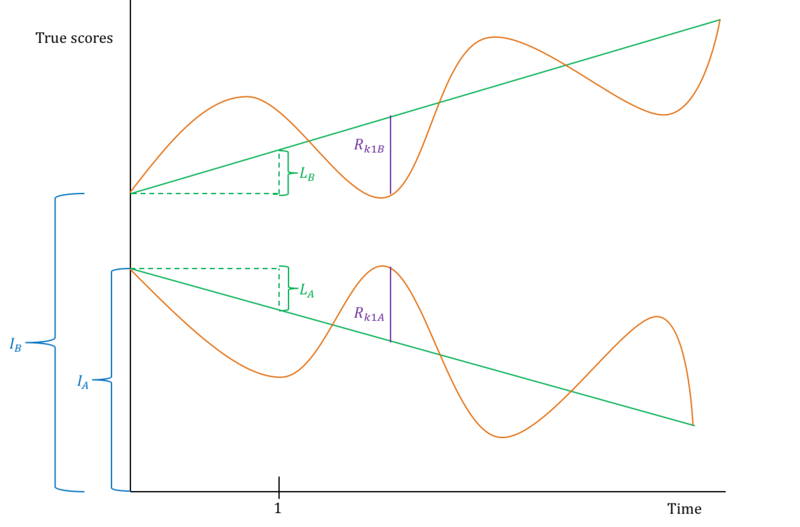 These effects represent the inertia of the change process (carry-over effects between two neighboring occasions of measurement. To test the hypothesis that the autoregressive process is time homogeneous the autoregressive parameters can be set equal within and between periods. Fixing the autoregressive parameters also helps to avoid estimation problems. The residual variables (UPkp in Figure 3a) indicate that part of a momentary latent WB state variable that is unpredictable by the intercept and slope factors as well as the state variables measured before. Finally, there is an indicator-specific factor in the model on which the second indicators load. Such a factor is often necessary because the two indicators are not perfectly homogenous (unidimensional). Like in the multidimensional model in Figure 2b the number of indicators is one less than the number of indicators considered (Eid, Schneider, & Schwenkmezger, 1999). If there are more than two indicators and, therefore, more than two indicator factors within a period they can be correlated within and between periods. If the indicators are unidimensional with respect to the latent state variable indicator-specific factors are not necessary. In the case of unidimensionality the assumption of indicator-specific factors can cause estimation problems (because they are not necessary and do not have substantive variance). Therefore, researchers can start with a model without indicator-specific factors and add them if they are necessary because a model without them does not fit the data. Mean stability and mean change between periods can be analyzed with respect to the period-specific intercept and slope factors. For example, after a WB intervention the mean values of the intercept factor can differ indicating that the intervention might have changed the general WB level. A change of the mean values of the slope factor would indicate that the intervention might have changed the developmental process. For WB research, a model without linear change model might be the more typical model because of adaptation processes that preclude a linear change. Therefore, stability and change of WB might be well represented by a state-trait model (Eid & Diener, 2004). In longitudinal studies, different types of measurement invariance over time can be considered (Millsap, 2011). Measurement invariance (MI) concerns the question whether the same WB states are measured or whether there is a structural change in the link between the latent and observed variables showing that the psychometric meaning of the WB measures has changed. The lowest level of MI is configural invariance. That means that the number of latent variables do not differ between occasions of measurement and time periods. Weak MI additionally assumes that the values of the loading parameters of the latent variables do not differ between occasions of measurement and time periods. Weak MI is necessary if one wants to relate the latent variables to other variables in extended models and to make sure that the structurally the same WB factors are measured on each occasion of measurement. Strong MI additionally requires that the intercepts of an observed variable do not change over time. The intercepts are not shown in the path models presented in this chapter. Intercepts are additional constants that are specific to an observed variable and mainly determine the mean value of the observed variables. Strong MI is required when one wants to compare latent means over time, e.g., the means of the intercept factors before and after an intervention. If strong MI is not given this would indicate that mean change was indicator specific and is not well-captured by the means of the latent variables. Strict MI would additionally assume that the variances of the error variables do not change over time. This is not required for relating latent variables to other variables or testing for mean differences but it is interesting to see whether the quality of WB measurements changes over time. Often it is also assumed that the autoregressive process is time-invariant with non-changing autoregressive parameters and residuals of the UP variables over time. The measurement model that is shown for one construct in Figure 3a can be extended by including other variables. For example, if there are multiple constructs, a measurement model can be specified for each construct and the mutual influences of the variables over time can be analyzed (e.g., Wickrama, Lee, O’Neal, & Lorenz, 2016). The model in Figure 3 assumes that the time lag between the occasions of measurements is the same between all occasions and for all individuals. This assumption might be violated, for example, in experience sampling studies in which occasions of measurements are individually selected. In such studies, the loadings of the intercepts and the autoregressive parameters have to consider these individual differences in time lags (Eid et al., 2012). This can be done, for example, in the context of dynamic structural equation modeling (Driver, Oud, & Voelkle, 2017; Asparouhov, Hamaker, & Muthen, 2017). How Can These Models Be Extended to Analyze Multiple Groups? The models presented assume that a sample of individuals was randomly drawn from a population. In WB research, the sampling process is sometimes more complex. Often, it is of interest to analyze different groups, for example, nations, intervention groups, schools, companies, etc. There are two ways to consider group differences – multigroup and multilevel analysis. In multigroup analyses different groups are selected because the researcher is interested in exactly these groups. In a replication of a study, a researcher would select samples exactly from the same groups. For example, the researcher might be interested in comparing women and men, China and the US, or an intervention with a control group. In this case, multigroup analysis is appropriate. In multigroup analysis a latent variable model is specified in each group and several hypotheses about between group differences with respect to the parameters of a model (e.g., factorial structure, mean differences, regression parameters) can be tested. The models considered in this chapter can be easily extended to multigroup analysis (e.g., Bock & Zimowski, 1997; Brown, 2015; Eid, Langeheine, & Diener, 2003). If there are many groups testing assumptions across groups (e.g., testing measurement invariance across many nations) can become very cumbersome. In this case, recent developments of methods for analyzing many groups can be applied (for an overview and comparison of different approaches see Kim, Cao, Wang, & Nguyen, 2017). In multilevel analysis, it is assumed that the groups themselves are randomly selected from a population of groups. For example, a WB researcher might be interested in work satisfaction and randomly select different companies (level-2 units) and employees within companies (level 1 units). The level-2 units are considered interchangeable. In a replication of such a study, the researcher would get a different sample of level-2 units. Like in multigroup analysis, the level-2 units can differ in the parameters of a model. In addition to multigroup analysis, however, the variations of the parameters between groups can be explained by other variables. Because the level-2 units are randomly selected, the parameters of the model have a distribution. It can be estimated how strong the variation of parameters is and to which degree level-2 differences in the parameters can be predicted by other level-2 variables (e.g., the organizational climate of a company). Multilevel extensions have been developed for the different types of psychometric models in Table 1 (e.g., Adams, Wilson, & Wu, 1997; Heck & Thomas, 2015; Skrondal & Rabe-Hesketh, 2014; Tay, Diener, Drasgow, & Vermunt, 2011; Vermunt, 2003; 2008). Multigroup and multilevel analyses require that the group membership of an individual is known. If a researcher has the hypothesis that the parameter of a model differ between subgroups but the subgroups are not known, latent class analysis can be combined with the models presented so far resulting in mixture distribution models (e.g., Hancock & Samuelsen, 2008). For example, latent variable models of longitudinal research can be extended to latent growth mixture models (Wickrama et al., 2016) or mixture distribution latent state-trait models (Courvoisier, Eid, & Nussbeck, 2007) to detect population heterogeneity with respect to the change process (e.g. degree of variability, mean growth rates). Latent variable models enable the estimation of unsystematic measurement error from systematic sources of WB differences. This allows avoiding methodological artifacts and estimation biases that are caused by measurement error. They also enable researcher testing theories about the measurement of WB as well as its causes and consequences in a sophisticated way. Latent variable models have been developed for different areas of application and can be combined and extended in manifold ways to fulfill the needs of empirical WB research. Adams, R. J., Wilson, M., & Wu, M. (1997). Multilevel item response models: An approach to errors in variable regression. Journal of Educational and Behavioral Statistics, 22, 47-76. Asparouhov, T., Hamaker, E.L., & Muthen, B. (2017). Dynamic structural equation models. Technical Report. Version 2. Los Angeles: Muthén & Muthén. Bartholomew, D.J. & Knott, M. (1999). Latent variable models and factor analysis. London: Arnold. Beaujean, A. A. (2014). Latent variable modeling using R. New York: Routledge. Birnbaum, A. (1968). Some latent trait models and their use in inferring an examinee’s ability. In F.M. Lord & M. R. Novick (Eds. ), Statistical theories of mental test scores (pp. 395-479). Reading, MA: Addison-Wesley. Bock, R. D. (1972). Estimating item parameters and latent ability when responses are scored in two or more nominal categories. Psychometrika, 37, 29-51. Bock, R. D. & Zimowski, M. F. (1997). Multiple group IRT. In W.J. van der Linden & Ronald K. Hambleton (Eds. ), Handbook of item response theory (pp. 433-448). New York: Springer-Verlag. Bollen, K. A. & Curran, P. J. (2004). Autoregressive latent trajectory (ALT) models: A synthesis of two traditions. Sociological Methods & Research, 32, 336-383. Bollen, K. A. & Curran, P. J. (2006). Latent curve models: A structural equation perspective. New York: Wiley. Brown, T. A. (2015). Confirmatory factor analysis for applied research. New York, NY: Guilford Press. Campbell, D. T., & Fiske, D. W. (1959). Convergent and disciminant validation by the multitrait-multimethod matrix. Psychological Bulletin, 56, 81-105. Cole, D. A., Martin, N. C., & Steiger, J. H. (2005). Empirical and conceptual problems with longitudinal trait-state models: Introducing a trait-state-occasion model. Psychological Methods, 10, 3-20. Collins, L. M. & Sayer, A. G. (Eds.). (2001). New methods for the analysis of change. Washington, DC: American Psychological Association. Courvoisier, D., Eid, M., & Nussbeck, F. W. (2007). Mixture distribution state-trait models. Psychological Methods, 12, 80-104. Cronbach, L. J. (1995). Giving method variance its due. In P. E. Shrout & S. T. Fiske (Eds. ), Personality research, methods, and theory: A festschrift honoring Donald W. Fiske (pp. 145-160). Hillsdale, NJ: Erlbaum. Curran, P. J. & Bollen, K. A. (2001). The best of both worlds: Combining autoregressive and latent curve models. In Collins, L. M. & Sayer, A. G. (Eds. ), New methods for the analysis of change (pp.105-136). Washington, DC: American Psychological Association. Deboeck, P. & Wilson, M. (Eds.). (2004). Explanatory item response models: A generalized linear and nonlinear approach. New York: Springer. Deinzer, R., Steyer, R., Eid, M., Notz, P., Schwenkmezger, P., Ostendorf, F., & Neubauer, A. (1995). Situational effects in trait assessment: The FPI, NEOFFI and EPI Question­naires. Euro­pean Journal of Personality, 9, 1-23. Driver, C. C., Oud, J. H. L., & Voelkle, M. C. (2017). Continuous time structural equation modeling with R package ctsem. Journal of Statistical Software, 77, 1-35. Duncan, T. E., Duncan, S. C., & Strycker, L. A. (2006). An introduction to latent variable growth curve modeling: Concepts, issues, and applications (2nd ed.). Mahwah, NJ: Lawrence Erlbaum. Eid, M., Courvoisier, D. S., & Lischetzke, T. (2012). Structural equation modeling of ambulatory assessment data. In M. R. Mehl & T.S. Connor (Eds. ), Handbook of research methods for studying daily life (pp. 384-406). New York: Guilford. Eid, M. & Diener, E. (1999). Intraindividual variability in affect: Reliability, validity, and personality correlates. Journal of Personality and Social Psychology, 76, 662-676. Eid, M. & Diener, E. (2004). Global judgments of subjective well-being: Situational variability and long-term stability. Social Indicators Research, 65, 245-277. Eid, M., Geiser, C., & Koch, T. (2016). Measuring method effects: From traditional to design-oriented approaches. Current Directions in Psychological Science 25, 275-280. Eid, M., Geiser, C., Koch, T., & Heene, M. (2016, August 15). Anomalous results in G-factor models: Explanations and alternatives. Psychological Methods. Advance online publication. Eid, M. & Hoffmann, L. (1998). Measuring variability and change with an item response model for polytomous variables. Journal of Educational and Behavioral Statistics, 23, 193-215. Eid, M., Holtmann, J., Santangelo, P., & Ebner-Priemer, U. (2017). On the definition of latent state-trait models with autoregressive effects: Insights from LST-R theory. European Journal of Psychological Assessment, 33, 285-295. Eid, M. & Kutscher, T. (2014). Statistical models for analyzing stability and change in happiness. In K. M. Sheldon & R. E. Lucas (Eds. ), Stability of happiness: Theories and evidence on whether happiness can change (pp. 263-297). Amsterdam: Elsevier. Eid, M., Langeheine, R., & Diener, E. (2003). Comparing typological structures across cultures by latent class analysis: A primer. Journal of Cross-Cultural Psychology, 34,195-210. Eid, M., Nussbeck, F. W., Geiser, C., Cole, D. A., Gollwitzer, M., & Lischetzke, T. (2008). Structural equation modeling of multitrait-multimethod data: Different models for different types of methods. Psychological Methods, 13, 230-253. Eid, M., Schneider, C., & Schwenkmezger, P. (1999). Do you feel better or worse? On the vali­dity of perceived deviations of mood states from mood traits. European Journal of Personality, 13, 283-306. Hagenaars, J. A. (1993). Loglinear models with latent variables. Newbury Park: Sage. Hagenaars, J. A., & McCutcheon, A. L. (2002). Applied latent class analysis. New York: Cambridge University Press. Hancock, G. R. & Samuelsen, K. M. (2008). Advances in latent variable mixture models. Charlotte, NC: Information Age Publishing. Heck, R. H. & Thomas, S. L. (2015). An introduction to multilevel modeling techniques. MLM and SEM approaches using Mplus. New York: Routledge. Heinen, T. (1996). 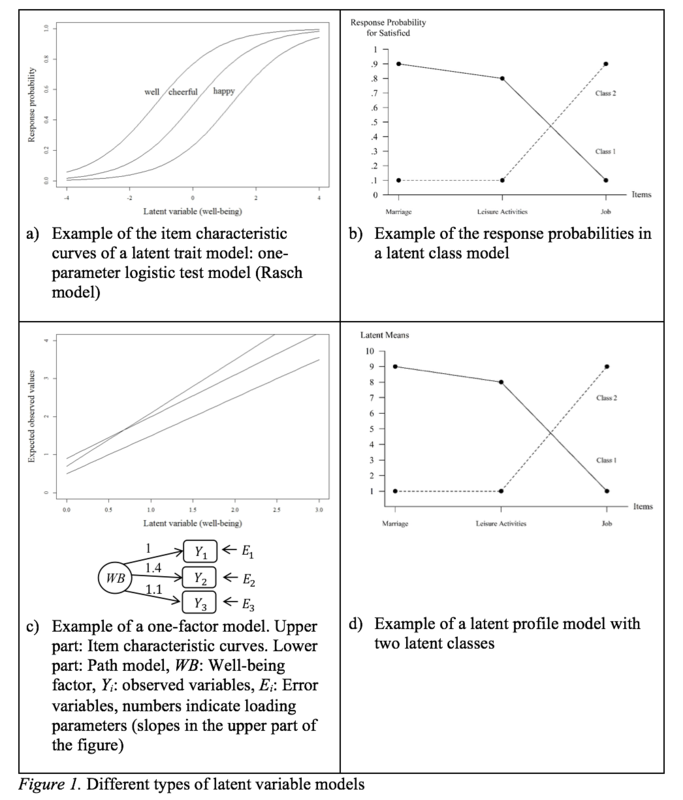 Latent class and discrete latent trait models: Similarities and differences. Thousand Oaks, California: Sage. Holzinger, K. & Swineford, F. (1937). The bi-factor method. Psychometrika, 2, 41-54. Hoyle, R. H. (Ed.) (2012). Structural equation modeling. Concepts, issues, and applications (2nd ed.). Thousands Oaks: Sage. Jöreskog, K. G. & Moustaki, I. (2001). Factor analysis of ordinal variables: A comparison of three approaches. Multivariate Behavioral Research, 36, 347-387. Kenny, D. A. (1995). The multitrait-multimethod matrix: Design, analysis, and conceptual issues. In P.E. Shrout & S. T. Fiske (Eds. ), Personality research, methods, and theory: A festschrift honoring Donald W. Fiske (pp.111-124). Hillsdale, NJ: Lawrence Erlbaum Associates. Koch, T., Eid, M., & Lochner, K. (in press). Multitrait-multimethod-analysis: The psychometric foundation of CFA-MTMM models. In P. Irwing, T. Booth & D. Hughes (Eds. ), The Wiley handbook of psychometric testing. London: John Wiley & Sons. Koch, T., Holtmann, J., Bohn, J., & Eid, M. (in press). Explaining general and specific factors in longitudinal, multimethod, and bi-factor models: Some caveats and recommendations. Psychological Methods. Laursen, B., Little, T. D., & Card, N. A. (Eds.) (2012). Handbook of developmental research methods. New York: Guilford. Lazarsfeld, P. F. & Henry, N. W. (1968). Latent structure analysis. Boston: Houghton Mifflin. Little, T. D. (Ed. ) (2013). Longitudinal structural equation modeling. New York: The Guilford Press. Lord, F. M. (1967). A paradox in the interpretation of group comparisons. Psychological Bulletin, 68, 304–305. Lord, F. M. & Novick, M. R. (1968). Statistical theories of mental test scores. Reading, MA: Addison-Wesley. Masters, G. N. (1982). A Rasch model for partial credit scoring. Psychometrika, 47, 149-174. McArdle, J. J. & Nesselroade, J. R. (Eds.) (2014). Longitudinal data analysis using structural equation models. Washington, DC: American Psychological Association. Mehl, M. R. & Conner, T. S. (Eds.) (2012). Handbook of research methods for studying daily life. New York: The Guilford Press. Millsap, R. E. (Ed.) (2011). Statistical approaches to measurement invariance. New York: Routledge, Taylor, & Francis Group. Molenaar, P. C. M., Lerner, R. M., & Newell, K. M: (Eds.) (2014). Handbook of developmental systems theory and methodology. New York: The Guilford Press. Mulaik, S. A. (2009). Linear causal modeling with structural equations. Boca Raton: CRC Press. Nering, M. L. & Ostini, R. (Eds.) (2010). Handbook of polytomous item response theory models. New York: Routledge. Nesselroade, J. R. (1991). Interindividual differences in intraindividual changes. In L. M. Collins & J.L. Horn (Eds. ), Best methods for the analysis of change: Recent advances, unanswered questions, future directions (pp. 92-105). Washington, DC: American Psychological Association. Newsom, J. T. (2015). Longitudinal structural equation modeling. A comprehensive introduction. New York: Routledge. Nussbeck, F.W., & Eid, M. (2015). Multimethod latent class analysis. Frontiers in Psychology, 6, Article 1332. Nussbeck, F. W., Eid, M., Geiser, C., Courvoisier, D. S., & Lischetzke, T. (2009). A CTC(M–1) model for different types of raters. Methodology, 5, 88-98. Nussbeck, F. W., Eid, M., & Lischetzke, T. (2006). Analyzing MTMM data with SEM for ordinal variables applying the WLSMV-estimator: What is the sample size needed for valid results? British Journal of Mathematical and Statistical Psychology, 59, 195-213. Oberski, D. L., Hagenaars, J. A., & Saris, W. E. (2015). The latent class multitrait-multimethod model. Psychological Methods, 20, 422-443. Ostini, R. & Nering, M. L. (2006). Polytomous item response theory models. Thousand Oaks: Sage. Rasch, G. (1960). Probabilistic models for some intelligence and attainment tests. Copenhagen: Nielsen & Lydiche. Reckase, M. D. (2009). Multidimensional item response theory. Dordrecht: Springer. Rogosa, D. R. (1995). Myths and methods: "Myths about longitudinal research," plus supplemental questions. In J. M. Gottman (Ed. ), The analysis of change (pp. 3-65). Hillsdale, New Jersey: Lawrence Erlbaum Associates. Rosseel, Y. (2012). Lavaan: An R package for structural equation modeling. Journal of Statistical Software, 48, 1-36. Rost, J. (1985). A latent class model for rating data. Psychometrika, 50, 37-49. Schumacker, R. E. & Lomax, R. G. (2010). A beginner’s guide to structural equation modelling (3nd ed.) Mahwah: Erlbaum. Singer, J. D. & Willet, J. B. (2003). Applied longitudinal data analysis. London: Oxford University Press. Skrondal, A. & Rabe-Hesketh, S. (2014). Generalized latent variable modeling: Multilevel, longitudinal and structural equation models (2nd ed.). Boca Raton, FL: Chapman & Hall. Steyer, R., Mayer, A., Geiser, C., & Cole, D. A. (2015). A theory of states and traits - revised. Annual Review of Clinical Psychology, 11, 71-98. Tay, L., Diener, E., Drasgow, F., & Vermunt, J. K. (2011). Multilevel mixed-measurement IRT analysis: An explication and application to self-reported emotions around the world. Organizational Research Methods, 14, 177-207. Vermunt, J.K. (2003) Multilevel latent class models. Sociological Methodology, 33, 213-239. Vermunt, J.K. (2008). Latent class and finite mixture models for multilevel data sets. Statistical Methods in Medical Research, 17, 33-51. Wickrama, K. A. S., Lee, T. K., O’Neal, C. W., & Lorenz, F. O. (2016). Higher-order growth curves and mixture modeling with Mplus. New York: Routledge. Willoughby, M., Holochwost, S.J., Blanton, Z.E., & Blair, C.B. (2014). Executive functions: Formative versus reflective measurement. Measurement: Interdisciplinary Research and Perspectives, 12, 69-95.